We may be called Coffee With Ravi, but today we are talking chai! Although we love coffee in the morning, we also love tea in the afternoon. Ravi grew up drinking chai and I had my fair share during our most recent trip back east. I occasionally drank English black tea with my family but never chai. Sweet and spicy, Indian chai is truly a treat and we want to share our recipe with you! India is the second largest producer of tea in the world, second only to China. The practice of Ayurveda has a long-standing tradition in herbal teas. In addition to the benefits of tea, chai utilizes medicinal benefits of other plants and spices to include cardamom, ginger, and cinnamon. The taste of chai is traditional sweet and milky with pleasant aromas of the added spices. Scattered throughout India are multiple street vendors or chai wallahs. 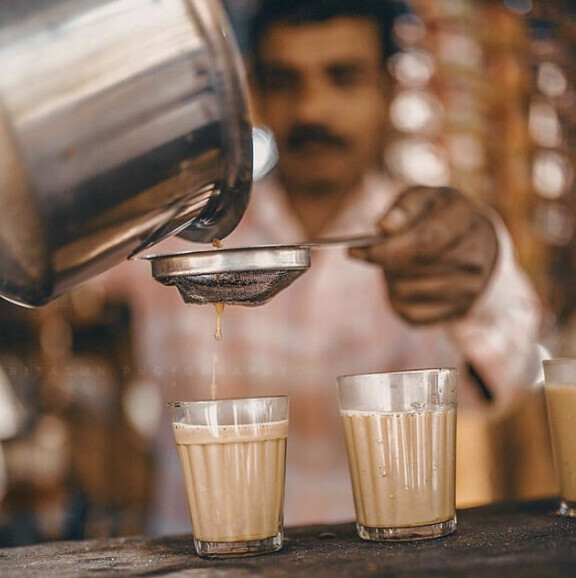 For India, chai is a part of the culture and rhythm of daily life. It is a chance to recharge and rejuvenate whether in a rural village or the megacity of Mumbai. Add tea, ginger, cardamom, and cinnamon to water and bring to boil. Add milk and sugar and bring to another boil. Strain into a cup or mug. Enjoy by yourself, with your family, or friends.